1. What are the maximum video and photo resolutions for the Zenmuse X3 and X5 cameras? Zenmuse X3: 4K videos; 12 megapixel photos. Zenmuse X3 Zoom: 4K videos; 12 megapixel photos. Zenmuse X5&X5R: 4K videos; 16 megapixel photos. 2. How do I switch to SmoothTrack, Lock and Selfie modes? The gimbal is set to SmoothTrack by default. To lock, press and hold the Trigger. Tap the Trigger twice to reset and re-enter SmoothTrack mode. Tap the Trigger three times to enter Selfie mode. 3. What are the four operation modes? Hanging: Osmo+ is upside down. Flashlight: Osmo+ is held out at 90 degrees, like a flashlight. Vertical: Osmo+ is held at 90 degrees to the left or right for a portrait photo or vertical video. 4. What’s the operating temperature range of the Osmo+? 5. How do I adjust the SmoothTrack speed? In the DJI GO app, go to Settings > Gimbal > Settings > Quick Set-up. 6. How much 4K video can 16GB or 64GB SD card hold? A 16GB Micro SD card can hold 36 minutes, and a 64GB Micro SD card can hold 145 minutes. 7. What kind of SD cards does the Osmo+ support? The Osmo+ supports up to 64GB Micro SD cards. The speed should be Class 10 or higher, or UHS-1. 8. Why are some selfies taken at arm’s length blurry? The Osmo+ is focused at 0.5 meter and beyond. Objects closer than that may appear blurry. 9. How can I download the videos to my computer from the Osmo+? Copy the videos directly from your SD card or by connecting the Osmo+ to a computer using the micro-USB port on the camera. Before doing so, turn on the Osmo+. 10. Why does the OSMO+ make a beeping sound while copying files via USB connection? This beeping warns that the gimbal’s movement is restricted and is caused by connecting a cable to the micro-USB port. 11. While recording a time-lapse video, recording is interrupted. Will the video be restored in the next recording? If the generated time-lapse video is longer than 6 seconds, the video will restore when the Osmo+ is turned on. Whether it can be automatically restored depends on the interval and duration. When video resolution is 720p at 30fps, if the video is 6 seconds long, at least 180 photos were taken. For example. If it takes 1s to capture a photo, the total time is 180s. 12. What kind of SD card does the Osmo+ Support? Panasonic UHS-3 (16GB), Lexar 633X (16GB), and Sandisk Extreme UHS-3(16GB). 13. Can Audio Recording be switched off? Yes, it can be changed in the app. Go to Settings – Camera – Audio Recording. 14. In HDR mode, how many photos will be created with each shot? 15. Are the Osmo+ camera and Handle locked to each other? No, the handles and cameras are interchangeable. 16. How do I adjust the gimbal speed? Advanced Gimbal Settings can be changed in the DJI GO app. After entering the Settings, the sensitivity and speed can be adjusted. 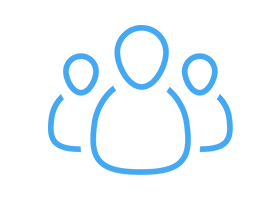 When adjusting the gimbal on the screen, if the blue circle is farther away from the center point, the gimbal rotation speed is larger. 17. How do I adjust the Pitch and Pan movement? In Upright Mode or Underslung Mode, move the joystick up or down to tilt and left or right to pan. In Flashlight Mode, move the joystick up or down to tilt. 1. Can the Osmo+ record audio? There is a built-in mic in the Osmo+. To improve the recording, a 3.5mm interface and external mic can be attached. The following microphones are compatible with the Osmo+: Sennheiser MKE400, Sony ECM DS70P, Rode VideoMic Pro, Rode VideoMicro, Mymyk Smartmyk, and DED DV-889. 2. Can the built-in mic and the external mic work at the same time? 3. Can the mobile device mic be used for sound recording instead of the Osmo+ mic? Yes. There will be no sound during playback from the Osmo+, but the sound will be available when the file is opened from the media library. To save a video with audio, the video must be longer than 7 seconds. 4. Is the power consumption for the two operating Wi-Fi frequencies, 2.4GHz and 5.8GHz, the same? No, the power consumption for 5.8GHz is higher. 1. What is the battery and voltage capacity? The standard Osmo+ battery reaches 980mAh, 11.1V, and 10.8Wh. A high-capacity version of the battery is also available. 2. How long does the battery last? 3. How can I tell if the battery has been fully charged? The LED indicator on the charger will be solid green when in standby and solid red during charging. When charging is complete, it will go from red to green. 4. Do need to I remove the battery if it is fully charged? Will the battery overcharge if I don’t? It takes about 60 minutes to charge the battery, and the Osmo+ Intelligent Battery has overcharge protection. When charging is complete or the battery is charging abnormally, it will stop charging automatically, so you don’t need to remove the battery once it’s fully charged. 1. How do I connect to the DJI GO app? On your mobile device, connect to the ‘OSMO+_XXXXXX’ Wi-Fi network. Enter the password: 12341234, then launch the DJI GO App on your mobile device. Find OSMO+ in the App and enter Camera View. 2. How can I review pictures and videos I have taken? Tap the playback button in Image Transmission Settings. 3. How do I adjust the gimbal when it tilts? In DJI GO app, go to: Settings > Gimbal > Roll Axis Adjustment. Positive values rotate the gimbal clockwise. Negative values rotate the gimbal counterclockwise. 4. How do I edit the video in the app? 5. What 4K video formats are supported on the Osmo+? The Osmo+ shoots 4K video in MP4 and MOV formats. Select the format in DJI GO - Settings - Video Format. 6. How do I activate the Osmo+? 7. Can the Osmo+’s sounds be switched off? The Osmo+’s sounds cannot be switched off however your smart device can be switched to silent mode silence shutter release and screen press sounds. 8. Why is the Osmo+’s gimbal soft and failing self-check after powering on when fully charged? Its left indicator blinks yellow and vanishes, the right indicator is solid green, and the display shows nothing except for the Wi-Fi signal. The Osmo+ has not been activated yet. Please activate the device. 9. Why aren’t videos being cached into the media library? Photos will be automatically cached to media library, but video auto-cache is not set to cache by default and can be switched on. If mobile device cache memory is full or if video capacity is larger than 2GB, the video also will not auto-cache. If the length of the video is less than 6s, the video will not auto-cache. 10. How do I take long exposure photos? Long exposure can be set in the camera settings beneath shutter speed in the DJI GO app. Go to S or M mode, then choose a slower shutter speed. 11. I can take timelapse videos and photos, but why can I only see videos in playback? Time-lapse photos are stored in the directory under Micro SD Card DCIM\TIMELAPSE. 12. If the Osmo+ is held upside down, will my videos or photos also be upside down? No, the Osmo+ will automatically flip the image so it’s oriented correctly. 13. Why are all my OSMO+ photos dated Jan 1st, 2014 until a smart device is connected? The camera cannot track save times by itself and requires connection to the DJI GO App. Connecting to a mobile device before shooting is recommended. 14. Why does the object I’m shooting become larger when shooting in Slow Motion Mode? The camera will automatically adjust its field of view to 52° in Slow Motion Mode. 15. How do I view a composite panoramic photo on my mobile device? Android: Media Library – Picture – Select Photo – Share Photo – Save. The Panoramic Composite Photo can also be viewed in the Playback but cannot be downloaded. IOS: Media Library – Picture – Select – Download. 16. If I switch the video format from NTSC to PAL, will the resolution change? No, because the camera will reset when switching from NTSC to PAL. 17. Can I zoom the screen when I capture the object? Can crop a photo during playback? The screen cannot zoom in, but you can zoom in the photo during playback. 1. Where are upgrade log files located? Upgrade logs are stored under ‘Micro SD-Misc - log - OSMO+_FW_LOG_AB_txt’. 2. Where is the upgrade package located when upgrading firmware in the DJI GO app? The upgrade package is saved in the DJI GO app. The upgrade package will be sent to the camera via Wi-Fi, and then sent to the Micro SD Card. 1. What mounts does the Extension Rod support? Shall I buy other accessories? The Extension Rod supports the bicycle mount, the universal mount, the mobile-phone holder, the extension rod and other accessories. The expanding arm can also be used by itself. 2. What is the screw type of the extension rod and the tripod? The screw type of the Extension Rod and the tripod is the British standard 1/4-20UNC. The Osmo+ cannot be installed directly onto the tripod, the Extension Rod is required. 3. Is it necessary to attach the Universal Mount to the Osmo+? No, the Universal Mount is only required if you want to add additional accessories, such as an external microphone. The universal mount can be attached to the same rosette mount used by the mobile phone holder. It can be installed using 1/4 inch screws. 4. What is the maximum speed that the vehicle mount can hold? The maximum speed is 100 km/h. If the speed is larger than it, it is recommended to mount it in the vehicle. 1. 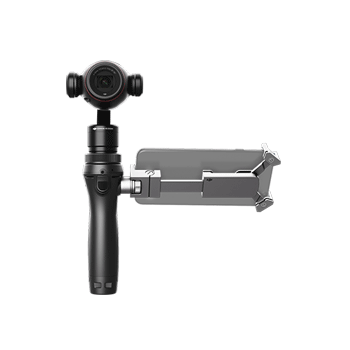 How do I mount the gimbal camera to the Osmo+ handle? Remove the gimbal cover and lens cover, then remove the handle cover and rosette mount cover. Rotate the Gimbal Lock to the unlocked position on the handle (align the white mark on the Gimbal Lock with the white line on the handle). Align the white line on the gimbal with the red line on the handle and insert. Make sure there is good contact between the gimbal and the Gimbal Lock. Rotate the Gimbal Lock so that both white marks align to lock the gimbal in place. Check to make sure the gimbal is mounted securely. 2. How should I prepare my Osmo+ before transporting it? Lock the roll axis first and then lock the pan axis. 3. How do I mount the mobile device holder? Align the base of the mobile device holder with the rosette mount. Turn the dial to tighten the mount against the Osmo+ handle. 4. How do I mount a mobile device? 1. Release the clamp arm on the mobile device holder. 2. Adjust the clamp positions. 3. Insert one side of the mobile device into the clamp. 4. Push the device to extend the holder then insert the other side of the mobile device. 5. How do I unlock the gimbal? 1. Twist the roll motor until it can rotate freely. 2. Slide the Pan axis Lock up to unlock the pan axis. ● Rotate the motors just enough to allow free motion. 6. How do I power on the Osmo+? Pull the power switch down for 1.5 seconds and then release it to power on the Osmo+. 7. How do I enter hibernation mode? When the Osmo+ is switched on, pull down and release the power switch to enter hibernation.